We can ship to worldwide range, and the shipping is free wherever you locate. Normally, orders are shipped by Hong Kong postal registered air mail. The vast majority of orders placed before 3PM HKT are shipped on the same day, the delivery time is about 8~15 working days. Some countries or remote regions may take a longer time. The delivery time is about 3-6 working days. If you need something urgently, you can purchase the "Express Delivery" with the product together. And please email us your phone number, it is necessary for the express delivery. We will ship it by UPS or DHL, that will be choosed based on the cost and convenience. 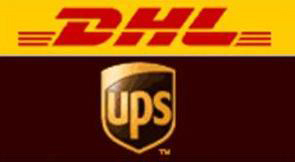 If your address can't be reached by UPS/DHL, you can inform us of your express company. The express charge to some countries / regions may be more than the price we list, we will inform you about the addtional cost, certainly, you can cancel the order and get a full refund if you don't agree it. 1. The delivery time is just an estimated arrival time, some countries or remote regions may take a longer time. 2. If the shipment is returned to us due to insufficient or incomplete address provided by you, we will have to re-charge you the re-shipment postage. So, please make sure the address is complete, including business name and suite number if the postal address is a business complex, and proper suburb name. When the 2nd Delivery and Service Charges are required for a replacement or exchange item(s), prepaid satchel or stamps would not be accepted, nor would they be returned. 3. The package delivery company will charge us US$10.00 for any refused packages with immediate effect. Therefore, please provide us with the correct postal address and name of the recipient. Otherwise, Customers would have to bear all the additional delivery and service charges, including that being imposed by the UPS or USPS.